This week I've been in Bogota, Colombia as guest of El Tiempo (the largest newspaper in Colombia and second largest media company in Latin America). 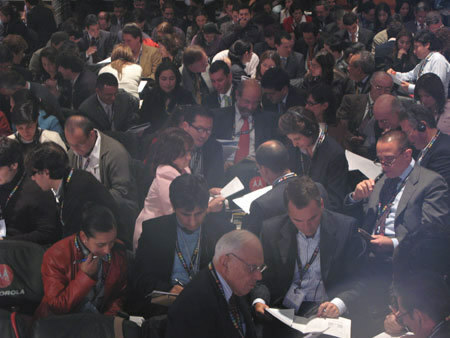 I did several creativity sessions for approximately 1,400 Bogota business people. Also on the program was Lyn Heward who was long-time president of Creative Content at Cirque du Soleil (I enjoyed meeting her and hearing her many stories). I found the audience (shown above doing one of my exercises) was quite receptive to the message of creativity in business. Indeed, there was a feeling of entrepreneurship and innovation in the air! This is probably a major reason why Colombia was recently featured in a BusinessWeek cover story. 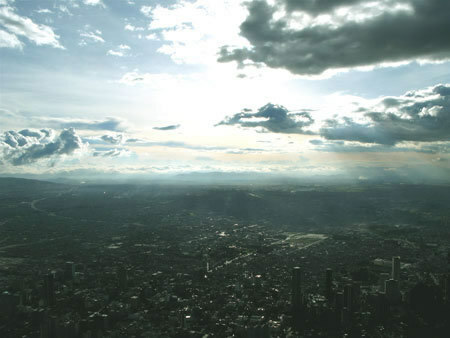 This sweeping vista shot of Bogota (below) is from high-above Monserrate. Many Americans, on their first trip to Bogota, are expecting to see Pablo Escobar on every corner. Such characterizations are unfair to Colombia — it would be like going to Chicago in the 1950s and expecting to see Al Capone. The weather in Bogota is moderate: year around temperatures in the low 70s (low 20s C). And you see flowers everywhere. My gracious hosts, Santiago Zapata and Carolina Solano of HiCue Speakers, gave us a great tour of their wonderful city. 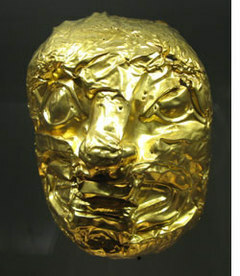 I especially enjoyed seeing the Museo de Oro with its astonishing pre-Colombian gold artifacts, the Botero museum, the historic central district, and best-of-all a trip on the tram to the top of Monserrate and its sweeping vistas of the city. I have a feeling I'll be returning to Bogota in the near future! Wow Roger... this must be quite a location. Plus I suppose that from a cultural point of view the journey must be fresh and insightful. As a Canadian who has lived in Bogota I will find it refreshing when the foreigners who visit Bogota and then write about it, won't need to start off with the typical...people expect to see Pablo Escobar on every corner...just a thought. Luc: Yeah, Bogota is certainly worth a visit! James: Good point. It will be nice when drugs and Escobar are the 10th things first-time visiting Americans think of before they arrive. Stereotypes die hard. As my host, Santiago Zapata, put it, "Most foreign visitors are blown away on their first trip here because the bar for their expectations is so low." I hope to return to Bogota again. I had a good experience there! Love the photos on this entry as well as the words. We just saw the French opera, Platee, and so we are up much later than I normally am. Interestingly, I could get subtitles in Spanish or English here. It was campy and very creative in its choreography and costumes, really all of it. I don't think I will make it to Columbia (Colombia) and so I appreciate your insights about it. Personalizes what the news says, and that is very helpful!